Ocho Rios is an amazing place to visit, but you can make it even more unbelievable by taking part in a dolphin encounter. You will learn interesting facts about dolphins as well as get the opportunity to swim with them in shallow water. 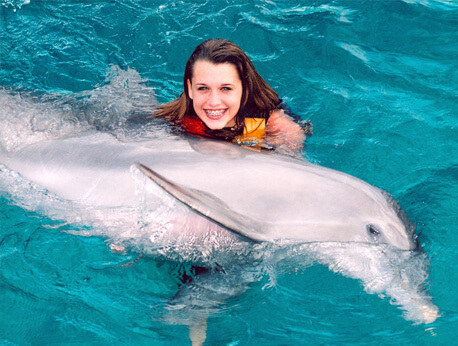 There are also several other land and sea activities that you can enjoy at Dolphin Cove. Dolphins are amazing creatures that are often out of reach, but when you travel to Ocho Rios, gentle dolphins are awaiting you at Dolphin Cove. Before you enter their world, you will learn about this wondrous creature by way of a thirty minute information session, and then the exciting interaction will begin. Standing in water that is roughly knee deep on an average adult, you will be able to shake the fin of a dolphin as well as receive the dolphin’s affection by way of hugs and kisses. This dolphin encounter is perfect for those who are not great swimmers, as the water is rather shallow. It is also a great adventure for your young children who may not be able to swim at all. Infants are also welcome on this once in a lifetime opportunity to interact with the dolphins, as the activity level of this encounter will not be too much to handle with a small child in tow. Each group will have about 12 minutes with the dolphins, so make sure to make the most of your time with these incredible creatures. You will also be able to enjoy several other activities at Dolphin Cove in Ocho Rios. If you want to enjoy other water based activities, you can take part in snorkeling adventures in the Caribbean or you can take the opportunity to interact with stingrays. Their barbs have all been removed, so you have nothing to fear. If you want to explore the Caribbean without actually getting in the beautiful blue waters, then you can enjoy kayaking in a glass bottom kayak or you can try your hand at being the captain of your own vessel, as you take a mini boat out on the water. If you decide that you’ve had enough water adventures for one day, there are plenty of things to do on the land after your dolphin encounter. You can trek back a jungle trail that is full of wildlife. This trail will be full of several species of exotic birds that will amaze you. There are also shark shows that you can watch, which will teach you more about these deep sea creatures that frighten many individuals. While you are enjoying your day, you can enjoy some of the tropical fruits and spices that are sold by local shops, or if you prefer, you can simply have your hair braided and relax on the beach.